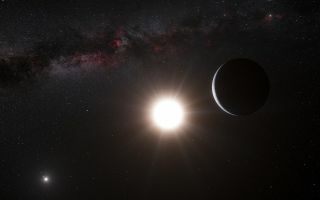 An artist's impression of Alpha Centauri, which involves two close-orbiting stars, with an Earth-mass planet in orbit around one. A third star orbits the close pair from a distance. Astronomers have long struggled with how young planets form around pairs of stars without destroying themselves, but new research suggests it can be done with the perfect setup: a massive, slightly elongated disk of debris from the star. Planets forming around a star with another stellar neighbor nearby must somehow overcome the gravity of the second star during the formation process. A new view of the process suggests that the material in two-sun systems similar to Tatooine in "Star Wars" can indeed overcome the star's destructive pull and form planets, even very small ones — if the planet-forming material around the star is sufficiently massive and the disk of material is slightly stretched. Planets form from the disk of dust and gas left over after their parent star is born. When that star is one of a pair, its companion can have a disruptive effect on planet formation. Previous studies have shown that binary stars separated by less than 20 times the Earth-sun distance should feel too much gravitational disruption from the companion star to form a planet around the host star. With half the stars in the solar system part of a binary system, this appears to be bad news for planet formation. Yet more than 20 percent of planets found using the same method as NASA's Kepler spacecraft exist around binary stars. To date, five planetary systems are known to exist around stars in close binaries: Three of them house massive Jupiter-size planets, while the other two have smaller satellites, including Alpha Centauri, which has an Earth-mass planet. Since their discovery, scientists have puzzled over how they could have formed. Planetary embryos form as gravity draws bits of gas and dust together. But if two pieces of rock are traveling too fast compared to one another, they will not merge but will instead suffer a catastrophic collision that may shatter one or both pieces at worst, and knock smaller pieces off at best. At the same time, the gravitational tug of the companion star will stretch the orbit of the dust and rock in the disk, causing them to collide at different speeds and angles that are not ideal for planetary formation. Think of it as a series of (very small) cars racing around the track of the disk. If two cars are traveling in roughly the same direction at comparable speeds, a small brush between the two of them causes very little damage (in this scenario, they would merge into a single car). However, if they are traveling at wildly different speeds, they will ricochet off one another, often with fatal results. A companion star would pull on that disk, sending the "cars" careening around in an unorderly fashion and smashing into one another more destructively. Silsbee and Rafikov modeled the formation of planet embryos, or planetesimals, in close binaries while for the first time factoring in the disk's own gravitational pull to help slow down the ricocheting action. The pair realized that if the disk was mildly eccentric — not perfectly circular but not significantly stretched out, either — the dust and rock would travel in orbits that would allow for smoother merging. The researchers found that a massive enough disk — at least a hundredth of the mass of the sun — could overwhelm the gravitational pull of the disruptive companion star, maintaining the slightly stretched elliptical orbit that allowed pieces to mesh together and smoothly form planets. "You basically want a massive disk in order for the disk gravity to dominate over the binary companion," Silsbee said. Although observations of close binaries have not yet revealed sufficiently massive disks, Rafikov and Silsbee said that the presence of Jupiter-mass planets in the observed systems suggests that the stars once housed disks large enough to form the enormous planets present today. "Disk mass cannot be much lower than at least several Jupiter masses, otherwise the disk simply would not contain enough gas to form these massive objects," the pair said in one research paper. The research was a detailed in May in a series of three papers in the Astrophysical Journal.